This Easy Broiled Lobster Tail Recipe is ready in about 10 minutes and is tender, buttery and delicious! Don’t let those lobster tails scare you, they’re actually super easy to make and are a sure way to impress at the dinner table. The key, as with most seafood, is to not overcook the lobster. If you overcook the lobster it can turn out chewy and have a fishy smell to it, which is unfortunate because lobster tails aren’t necessarily cheap. You’re going to want to pay close attention to the color of the lobster while it cooks. It should turn from opaque to white and start to curl in on itself slightly. First thing you’re going to want to do is use some sharp kitchen scissors to cut down the middle of the lobster shell, just until you get to the fins. Be careful to not cut into the lobster meat. Gently pull the shell away from the lobster meat, leaving the lobster meat exposed in the shell. Have you ever been to a restaurant and ordered a lobster tail and when it comes out the lobster meat is sitting on top of the tail? 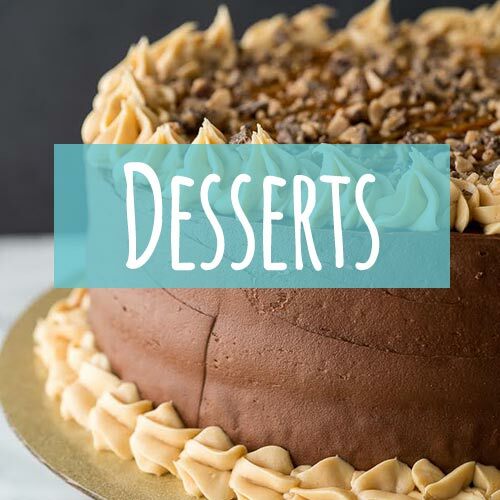 This pretty presentation is super easy to do! Once you have the lobster tail cut down the middle, carefully grasp the lobster meat and pull up, until the leg meat separates from the tail. Leave the very end of the tail meat attached at the base, and then, while holding the meat up, close the lobster tail shell underneath the meat. Lay the lobster meat on top of the shell and proceed cooking it the way I’m directing in the recipe below. For this recipe, I just kept it simple, by leaving the lobster meat inside the tail. I like this way because the butter that I lay on top of the lobster before cooking seems to soak in better. 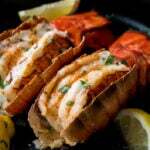 How Long To Cook Lobster Tails in the Oven? 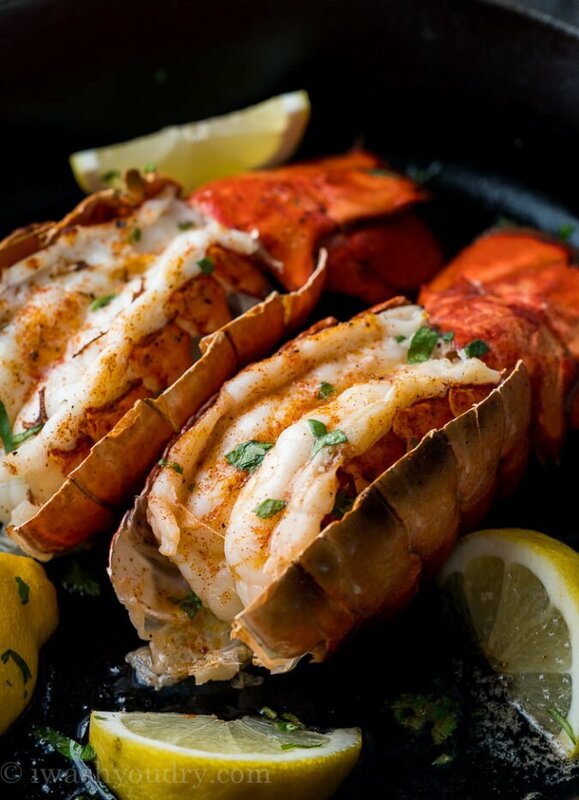 Most lobster tails should be cooked in about 7 to 10 minutes in the hot oven. If your lobster tail is bigger, expect it to take a little longer. 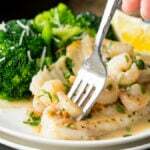 Seafood is safe to eat when it reaches 145° F (62.8 °C). If you’re concerned it’s not cooked all the way, use a digital instant read thermometer in the thickest part of the lobster tail to check the temperature. Make sure to preheat your oven to HIGH broil so it cooks efficiently. Don’t over season the lobster tail! Lobster is so delicious in it’s purest form, you really want to make sure you don’t over power it with too much seasoning. Lightly season with salt, pepper a dash of paprika for a delicious smoky flavor and a pat of butter on top is all you need. If desired you can also add some garlic powder, a pinch of cayenne pepper, or some old bay seasoning to spice it up a little more. Once the lobster tails are cooked the shells will turn a bright red and the meat will be super tender and buttery! Serve with a lemon wedge and garnish with a little parsley for a pretty presentation. 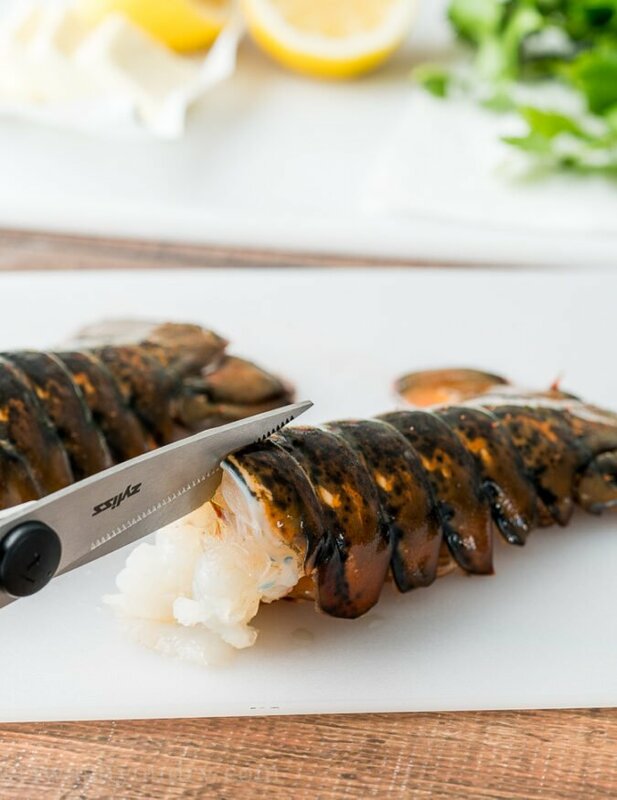 You’ll definitely want to make sure your lobster tails are thawed 100% before cooking, this will prevent uneven cooking in the lobster. Unless you live on the coast, you’re most likely going to be working with either a previously frozen, or still frozen lobster tail. So how do you thaw the lobster tails quickly and efficiently? Place the frozen lobster tails in a bowl of cold water for about 30 minutes, until the lobster is no longer frozen. DO NOT try to thaw lobster in hot water or in the microwave. Seafood is delicate and will cook quickly and unevenly using these methods. If you have more time to work with, you can place the frozen lobster tails in the fridge 24 hours prior to cooking to defrost. 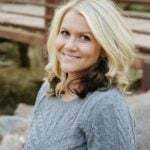 What Should I Serve With Lobster Tails? 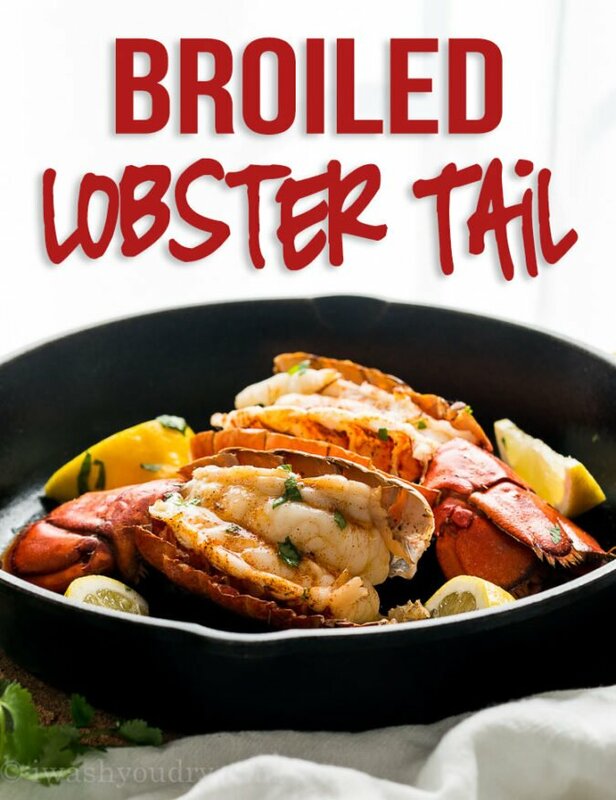 Making an elegant dinner at home is easy with this simple and easy Broiled Lobster Tail Recipe, but what do you serve with the lobster? Try any of these delicious dishes to accompany your lobster dinner. Parmesan Roasted Asparagus would make an awesome side dish. Serve the lobster with this simple Brown Butter Pasta for an elegant touch. Skip the expensive restaurants and make your own Perfectly Broiled Lobster Tails at home! You’ll be shocked at how easy it is! Perfectly Broiled Lobster Tails ready to enjoy in about 10 minutes! So much better than going to a fancy restaurant! Preheat the top broiler in your oven and position the top rack about 4 to 6 inches from the element. 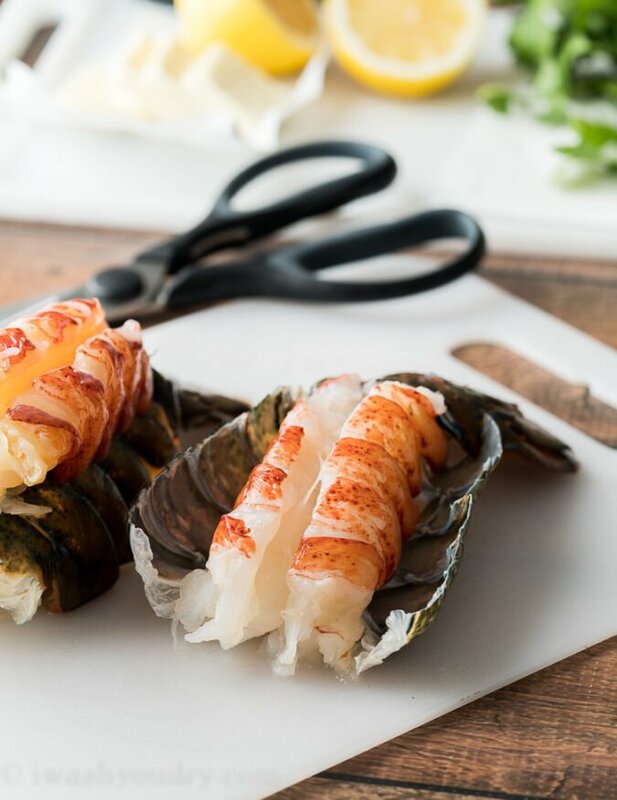 Use sharp kitchen scissors to cut down the middle of the lobster tail, being careful to only cut the shell, not the lobster meat. Cut all the way down to the fins of the tail. Turn the lobster tail over and use both thumbs to gently crack each rib of the lobster (between the little feet of the lobster), this will make it easier to pull the shell apart and reveal the lobster meat. 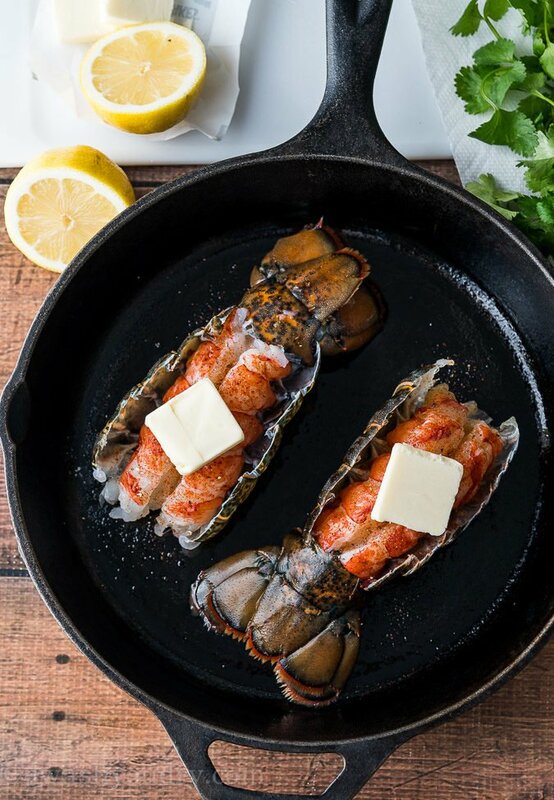 Place the lobster tails in a cast iron pan or foil lined baking sheet and season with salt, pepper and paprika. 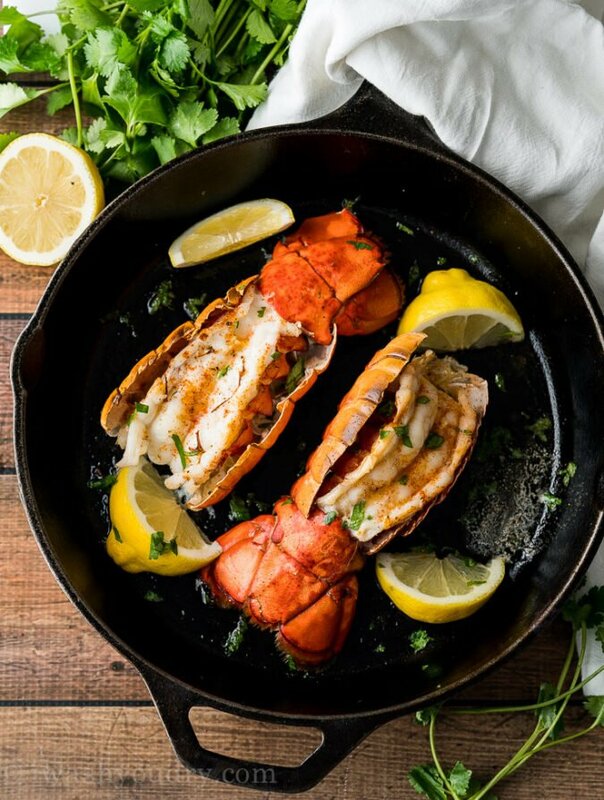 Place 1 tbsp of butter on top of each lobster tail and place on the top rack of the oven for 7 to 10 minutes, until lobster meat turns from opaque to white and is slightly browned on top. Careful to not let the lobster burn, keep an eye on it! 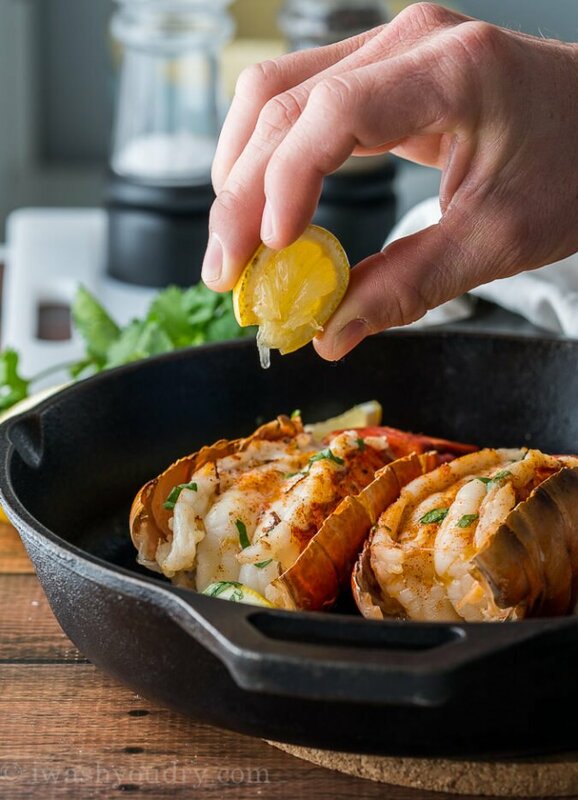 Serve the lobster tails immediately with a lemon wedge and garnish with fresh parsley. 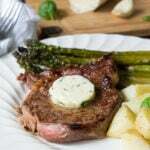 Serve with melted butter on the side if desired. I love seafood like shrimp, cream legs and if course lobster tail yum. Well I’ve cooked everything but the lobster. When I’m out eating I notice it seems to be one thing you can do is not under our over cook, so I’m here following your recipe for it thanks I’m enjoying my tails with lemon butter. Why do you say lay lobster on top of shell, but I every picture, it’s in the shell? 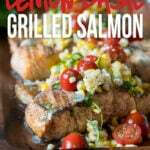 Hello Shawn, I just found THIS EZ LOOKING RECIPE!! I LOVE LOBSTER but VERY RARELY get to have! Such EZ STRAIGHT FORWARD DIRECTIONS! SORRY FOR CAPS ! BUT I’M SO EXCITED TO WANT TO TRY YOUR RECIPE!! NEXT MONTH IS MY 65th BIRTHDAY! 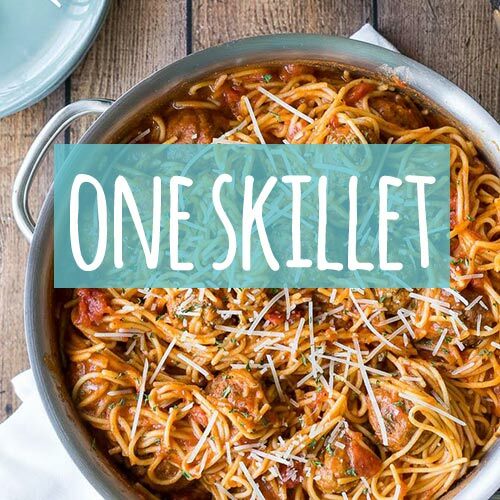 I’M PLANING NOW TO MAKE THIS WITH “RED LOBSTER CHEDDAR BISCUITS, ALONG WITH LOADED BKED.POTATO, ETC. I don’t understand why the sodium content is so awful high. I don’t see anything in the ingredients that would cause that. Lobster is naturally higher in sodium (probably due to the fact that it’s from the ocean).